Pharrell, Kendrick Lamar and Alicia Keys shoot their new music video, Nicki Minaj parties and Pharrell gets slimed in the pictures you might have missed this week. 1. 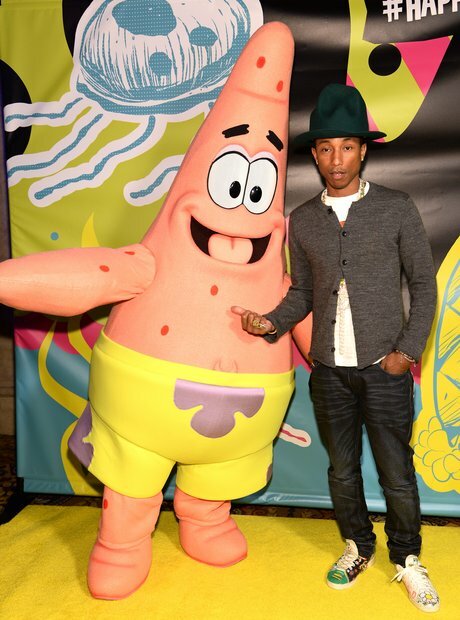 1) When Pharrell had a Spongebob Squarepants themed birthday party. 3. 3) And had an epic Spongebob Squarepants cake. 4. 4) Alicia Keys and her husband Swizz Beats were there for the New York party. 5. 5) And laughs were being shared all round. 6. 6) When Trey Songz performed in Cancun for MTVu Spring Break 2014. 7. 7) He was also joined by Kid ink who took his top off to keep cool! 8. 8) Lets face it, they probably are having a better weekend than you! 11. 11) When Rihanna went for a casual dinner with her dad. 12. 12) When Pharrell, Stevie Wonder and Snoop Dogg spent time in the studio together. 13. 13) When Beyoncé had a message for the haters. 14. 14) When Rick Ross casually showed off the bowling lane in his new house. 16. 16) When Future and Mike WiLL Made It Went for a drink. 17. 17) When Justin Timberlake performed in London's O2 Arena. 18. 18) When Beyonce and Jay Z Basket Ball Game went to a basketball game in Brooklyn. 19. 19) When Iggy Azalea went for the purple look on a night out. 20. 20) When Big Sean and Drake shared the stage. 23. 23) When Drake thought the camera was on the floor. 24. 24) When Nicki Minaj showed off her new look at her brothers 16th birthday party. 26. 26) When Beyonce and Blue Ivy went out for the day following the end of Bey's Mrs Carter World Tour. 27. 27) When Pharrell and his wife attended to Kids' Choice Awards 2014. 28. 28) And Pharrell got slimed! 29. 29) When Big Sean met Seth Rogen. 30. 30) When Martin Garrix headlined at Ultra Music Festival in Miami.